The Missoulian is a daily newspaper printed in Missoula, Montana. Its print readership is 72,405 on Sundays,53,333 on weekdays, the newspaper has been owned by Lee Enterprises since 1959. The Missoulian is the largest published newspaper in western Montana, the Missoulian is distributed throughout the city of Missoula and throughout most of Western Montana. The Missoulian was established as the Missoula & Cedar Creek Pioneer on September 15,1870, by the Magee Brothers, though strictly conservative politically, the paper was never intended to advance any particular clique or party. It served as a Democratic paper that was devoted to reporting on the development of western Montana, a month Frank Woody, who would become Missoulas first mayor, was named ad interim, and he would lengthen the name to the Montana Pioneer. On February 8,1873, Woody and his partner T. M. Chisholm purchased the paper, W. R. Turk replaced Chisholm and Woody would sell out a year later, but the papers name has more-or-less stayed the same until today. Turk died of tuberculosis in 1875 and the paper was published by Chauncey Barbour until August 15,1879 when Duane J. Armstrong became editor and publisher. 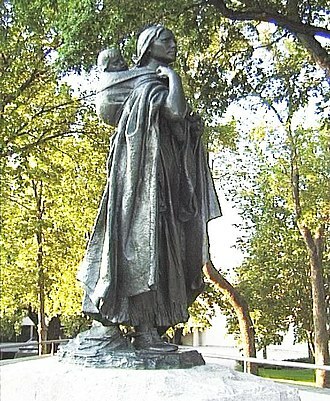 Hammonds purchase of The Missoulian brought the newspaper into the fold and on the battle lines of the William A. Clark. Hammond was a baron and business partner of Daly in the Montana Improvement Company who saw the Democratic president. Hammond had become very wealthy over-logging unsurveyed public timberland and supplying lumber to the railroad and his associates in Missoula convinced Daly to thwart Clarks 1888 bid for the Montana Territorys At-large congressional district and support Republican Thomas H. Carter instead. Despite Clark crying foul, Carter would go on to win, Dalys election maneuvering created a major rift between the Copper Kings, and the next year he would become chairman of the Montana Democratic Party. He asked for Hammonds support and Hammond responded by delivering a Republican sweep of the Missoula delegation and this infuriated Daly, who declared war on Hammond and threatened to make grass grow in the streets of Missoula. What has Anaconda ever done for Missoula, anyway, if Christ came to Anaconda he would be compelled to eat, sleep and pray with Marcus Daly. Though the majority of Missoula County voted for Anaconda as capital, in 1900, Hammond began selling stock in the Missoulian to political rival Joseph M. Dixon who would become a US Congressman, US Senator, and the state of Montanas seventh governor. His experience would help modernize the paper and expand its reach. Dixon would lose the election in a Democratic sweep and would lose the paper for financial reasons five years later, the Missoulian was not a Company paper, according to Jerre Murphy, a former Amalgamated employee turned muckracker it was the only major newspaper in Montana that was not. After his election defeat Dixon turned the Missoulian against Amalgamated with scathing editorials, with Dixon refusing to sell the paper, the Company chose bribery by offering Dixon the Missoula Sentinel that Dixon felt was splitting the citys advertising dollars. The Battle of the Big Hole was fought in Montana, August 9–10,1877, between the U. S. Army and the Nez Perce tribe of Native Americans during the Nez Perce War. 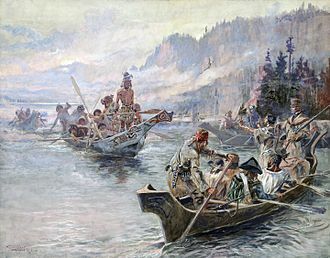 The Nez Perce withdrew in order from the battlefield and continued their long fighting retreat that would result in their attempt to reach Canada. The Nez Perce leaders had led their people on an extensive trek after the Battle of the Clearwater to escape the soldiers of General Oliver Otis Howard, the Nez Perce crossed from Idaho into Montana via rugged Lolo Pass. After a brief confrontation at Fort Fizzle on July 28 the Nez Perce entered the Bitterroot Valley, Looking Glass seems to have taken over leadership from Chief Joseph. Looking Glass persuaded the Nez Perce that Howard was far behind, their progress was leisurely and they took few precautions for defense, not sending out scouts or setting pickets to guard their encampments. They left the Bitterroot Valley, crossed a range, and camped in the Big Hole Basin. The Nez Perce numbered about 750 persons in all with about 200 warriors, unknown to the Nez Perce, Colonel John Gibbon had left Fort Shaw with 161 officers and men and one howitzer. 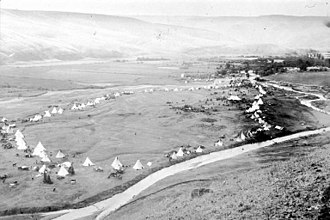 Following the trail of the Nez Perce he collected 45 civilian volunteers in the Bitterroot Valley, on August 8, Gibbon located the Nez Perce encampment in the Big Hole. That night Gibbon marched overland to the Nez Perce camp, reaching it at dawn, leaving his 12-pound howitzer and he had come to fight, his orders were no prisoners and no negotiations. Between Gibbon’s position and the Nez Perce encampment, which consisted of 89 tipis in a V-shaped pattern, was the waist-deep, approaching the Nez Perce encampment on foot at dawn, Gibbon’s men encountered an old Nez Perce man and killed him. The soldiers crossed the river and rushed into the village and began firing into the tipis where most of the Nez Perce were still sleeping, the Indians were taken by surprise and fled in all directions. Gibbon’s men fired indiscriminately at men and children – although some of the women were said to have been armed, lieutenant James H. Bradley, leading Gibbon’s left wing, was killed early in the battle. Leaderless, his men did not continue their advance and left the part of the village unoccupied, giving a refuge. The Sapphire Mountains are a range of mountains located in southwestern Montana in the northwestern United States. To the west is the Bitterroot Valley, and to the east is Rock Creek, the southern end of the range meets the larger Anaconda Range at West Pintler Peak. The northern segment of the range is part of the Lolo National Forest, the range includes part of the Threemile Wildlife Management Area, the Welcome Creek Wilderness Area, the Skalkaho Game Preserve, and the Anaconda-Pintler Wilderness Area. The range is bisected by just two roads, Route 38 at 7250 foot Skalkaho Pass and FS80 at Lutz Creek. Besides West Pintler Peak, the highest point in the Sapphire Mountains is Kent Peak, located at 46°03. 79N, the Sapphires contain three large National Forest roadless areas, in addition to the officially protected Welcome Creek Wilderness. 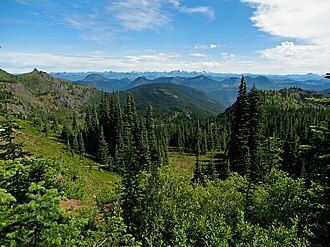 The northernmost, about 77,000 acres in size, is centered on Quigg Peak and this area is characterized by thousands of acres of sliderock or talus slopes, and extensive Douglas-fir and lodgepole pine forests rising to open, glaciated ridges. 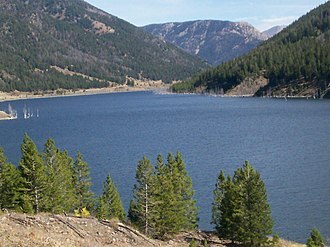 Bitterroot National Forest comprises 1.587 million acres in west-central Montana and eastern Idaho, of the United States. 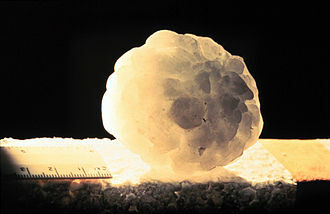 It is located primarily in Ravalli County, but has acreage in Idaho County and Missoula County, Montana. Founded in 1898, the forest is located in the Bitterroot, roughly half the forest make up part or all of three distinct Wilderness areas. These areas include the Anaconda-Pintler, Selway-Bitterroot and Frank Church River of No Return Wildernesses. The distinction is that in areas, no roads, mining or other construction is permitted and all access must be done either on foot or horseback. Hunting, however is allowed forest-wide including wilderness areas, the Lewis and Clark Expedition passed through parts of what are now forest lands in 1805. After the discovery of gold in Idaho and Montana in the 1860s, numerous mining towns were built, heavy logging and other resource depletion beginning in the 1880s led conservationists to push for the preservation of the forest. The Bitter Root Forest Reserve was established by the General Land Office on March 1,1898 with 4,147,200 acres and it was transferred to the U. S.
Forest Service in 1906. On July 1,1908 the name was changed to Bitterroot National Forest, with lands added from Big Hole National Forest, other lands were transferred from Bitterroot to Beaverhead, Nez Perce and Salmon National Forests. On October 29,1934 part of Selway National Forest was added, in August 2016, the a wildfire burnt down fourteen houses. The forest is a combination of both grasslands and forested zones, grazing rights are leased to private landowners in the lower altitudes where grasses and shrublands are dominant. Higher up, Douglas fir and lodgepole pine slowly give way to Engelmann Spruce, above the treeline at 8,000 feet the trees abruptly end and alpine flowers and grasses are found. A small grizzly bear population is located in the zones of the forest with black bear, mountain goat, bighorn sheep, elk. An active effort to reintroduce the grizzly bear to the region concluded in 2000 with a plan to release 25 bears into the wilderness zones over a period beginning in 2003. Hamilton is a city in and the county seat of Ravalli County, United States. The population was 4,348 at the 2010 census, significant outlying population growth is shown in the area, the ZIP Code Tabulation Area for Hamiltons ZIP Code,59840, had a population of 12,979 at the United States Census Bureau 2013 estimate. Hamilton was founded by copper king Marcus Daly in the late 19th century and it was named for J. W. Hamilton, who provided the right-of-way to the railroad. Daly is said to have wanted to begin business in the county seat of Grantsdale. He supposedly founded Hamilton out of his own pocket as a reaction to being rebuffed at Grantsdale, the Ravalli County Museum, founded in 1955, is located in the former Ravalli County Courthouse and focuses on County history, natural history and art. 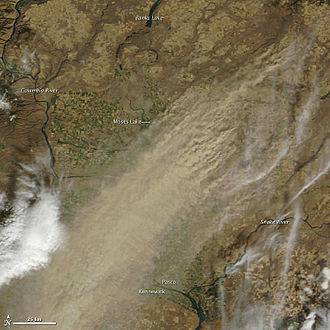 In the summer of 2000, Hamilton made international headlines when forest fires throughout the Bitterroot Valley filled the area with smoke, president Clinton declared a state of emergency in the area and dispatched National Guardsmen to assist with fighting the fires. Hamilton is, as of 2004, home to two research and production facilities, the government-run Rocky Mountain Laboratories, and a branch of the Corixa Corporation. The Corixa Corporation was bought by GlaxoSmithKline in 2005, NIAID completed construction of a Biosafety Level 4 biohazard laboratory as part of the Rocky Mountain Laboratories facility in 2008. This facility has begun operations using highly-pathogenic organisms including the Lentivirus family of viruses, Hamilton is located at 46°14′54″N 114°9′35″W. 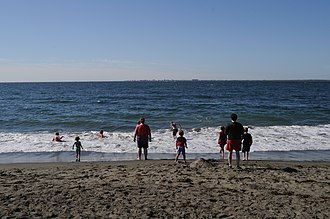 According to the United States Census Bureau, the city has an area of 2.57 square miles. As of the census of 2010, there were 4,348 people,2,175 households, the population density was 1,718.6 inhabitants per square mile. There were 2,456 housing units at a density of 970.8 per square mile. The racial makeup of the city was 95. 0% White,0. 3% African American,0. 6% Native American,1. 4% Asian,0. 2% from other races, hispanic or Latino of any race were 3. 1% of the population. 47. 0% of all households were made up of individuals and 22. 8% had someone living alone who was 65 years of age or older, the average household size was 1.92 and the average family size was 2.72. They were pursued eastward by the U. S. Army in a campaign led by General Oliver O. Howard. This 1, 170-mile fighting retreat by the Nez Perce in 1877 became known as the Nez Perce War, coverage of the war in United States newspapers led to widespread recognition of Joseph and the Nez Perce. For his principled resistance to the removal, he became renowned as a humanitarian, Chief Joseph was born Hinmuuttu-yalatlat (alternatively Hinmaton-Yalaktit or Hin-mah-too-yah-lat-kekt, or Hinmatóoyalahtqit in the Wallowa Valley of north eastern Oregon. He was known as Young Joseph during his youth because his father, was baptized with the same Christian name, while initially hospitable to the regions newcomers, Joseph the Elder grew wary when settlers wanted more Indian lands. Tensions grew as the settlers appropriated traditional Indian lands for farming and grazing livestock, isaac Stevens, governor of the Washington Territory, organized a council to designate separate areas for natives and settlers in 1855. 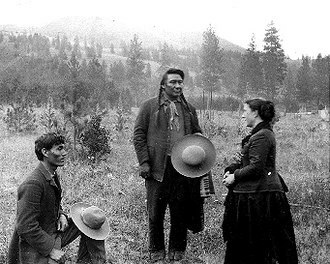 Joseph the Elder and the other Nez Perce chiefs signed a treaty with the United States establishing a Nez Perce reservation encompassing 7.7 million acres in present-day Idaho, the 1855 reservation maintained much of the traditional Nez Perce lands, including Josephs Wallowa Valley. It is recorded that Chief Josephs father requested that Young Joseph protect their 7. 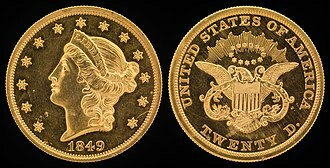 7-million-acre homeland, an influx of new settlers, attracted by a gold rush, led the government to call a second council in 1863. Government commissioners asked the Nez Perce to accept a new, much smaller reservation of 760,000 acres situated around the village of Lapwai in Idaho, in exchange, they were promised financial rewards, and a hospital for the reservation. 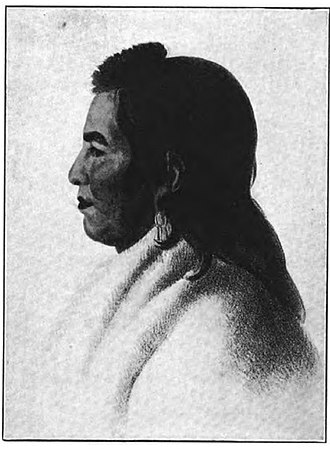 Chief Lawyer and one of his allied chiefs signed the treaty on behalf of the Nez Perce Nation and their refusal to sign caused a rift between the non-treaty and treaty bands of Nez Perce. The treaty Nez Perce moved within the new boundaries, while the non-treaty Nez Perce remained on their lands. Blodgett Canyon is located in southwestern Montana in the northwestern United States. It is one of more than two dozen scenic canyons deeply carved into the flanks of the Bitterroot Range in Bitterroot National Forest. Starting from a group of peaks at over 8,500 feet along the Idaho/Montana border, after running northeast for about a mile, it turns due east and descends for a total of about 12 miles to the Bitterroot Valley. A trailhead is located at the mouth of the canyon, just west of the community of Hamilton, the vertical canyon walls in the lower section rise over 2,000 feet above Blodgett Creek. Printz Ridge and Mill Point make up the wall, while Canyon Peak. The upper section of the canyon is part of the Selway-Bitterroot Wilderness Area, in the year 2000, the forest in the lower section of Blodgett Canyon was extensively burned. This damage extends about 2 miles above the trailhead, Blodgett Canyon is known among the climbing community as one of the best big wall climbing spots in Montana and the region. In the United States, the definition of cider is usually more broad than in Europe, specifically Ireland and the UK. 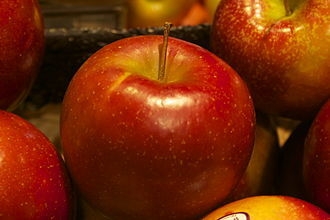 There are two types, one being the traditional fermented product, called hard cider, and the sweet or soft cider. The history of cider in the United States is very closely tied to the history of growing in the country. However, other edible cash crops were planted, like rice and apples, since such would have had value in the markets of growing cities like London, Edinburgh and Cardiff. The earliest known provision for making is believed to have been carried on the Mayflower itself in 1620. Halfway through the journey, the ship was caught in a storm, the great iron screw, taken from a cider press, helped brace the beam to keep the ship from breaking up and did it long enough to make it to the New World. Nine days after the Puritans landed a man by the name of William Blackstone planted the first apple trees in the New England colonies, the first recorded shipment of honeybees to America, important for the pollination of apples, is recorded in 1622 in Virginia. In New England, John Winthrop, governor of Massachusetts Bay Colony in 1632, unbeknownst to the colonists leaving for the New World, they faced an uphill battle in planting some of their favorite foods, including apples. Additionally, the businesses of diseases and temperature all presented challenges to growing in Eastern America, fungi like cedar-apple rust destroyed trees abilities to produce fruit, since it infects the buds they grow, making them sterile. 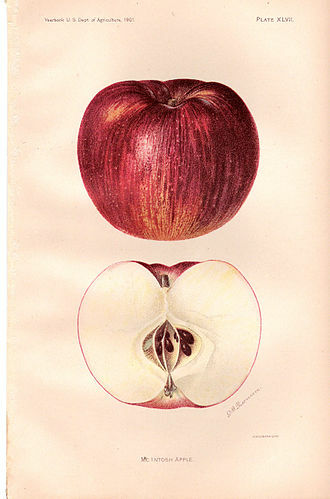 In the case of the British or French derived apples, it proved disastrous since unlike native Malus species it had no immunity and would eventually die, covered in cankers. In 17th century Britain, orchards had been kept in an open area for generations as most of the forest had been already cleared. But in America, leaving the trees without a fence in the open resulted in attracting nearby populations of black bears, skunks, elk. The climate of the American Southeast had more extremes, where temperatures would easily exceed 26 °C in summer, the earliest known full blown successful orchard in America began in Massachusetts Bay Colony near what is today modern Boston. The Clark Fork, or the Clark Fork of the Columbia River, is a river in the U. S. states of Montana and Idaho, approximately 310 miles long. The largest river by volume in Montana, it drains a region of the Rocky Mountains in western Montana. The river flows northwest through a valley at the base of the Cabinet Mountains. In its upper 20 miles in Montana near Butte, it is known as Silver Bow Creek, interstate 90 follows much of the upper course of the river from Butte to northwest of Missoula. The highest point within the watershed is Mount Evans at 10,641 feet in Deer Lodge County. The Clark Fork is a Class I river for recreational purposes in Montana from Warm Springs Creek to the Idaho border, the Clark Fork should not be confused with the Clarks Fork of the Yellowstone River, which is located in Montana and Wyoming. It rises as Silver Bow Creek in southwestern Montana, less than 5 miles from the Continental Divide near downtown Butte, from the confluence of Basin, near Deer Lodge it receives the Little Blackfoot River. From Deer Lodge it flows generally northwest across western Montana, passing south of the Garnet Range toward Missoula, five miles east of Missoula, the river receives the Blackfoot River. Northwest of Missoula, the river continues through a valley along the northeast flank of the Bitterroot Range. It receives the Bitterroot River from the south-southwest approximately 5.5 miles west of downtown Missoula, along the Cabinet Mountains the river receives the Flathead River from the east near Paradise. It receives the Thompson River from the north near Thompson Falls in southern Sanders County, at Noxon, along the Cabinet Mountains and the northern end of the Bitterroots near the Idaho border, the river is impounded by the Noxon Rapids Dam to form a 20-mile-long reservoir. 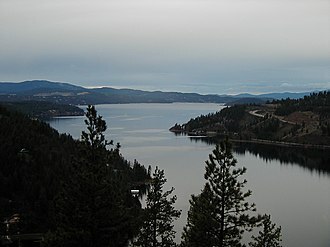 It crosses into eastern Bonner County in north Idaho between the towns of Heron and the town of Cabinet, approximately 8 miles west of the Idaho–Montana border, the river enters the north eastern end of Lake Pend Oreille, near the town of Clark Fork. 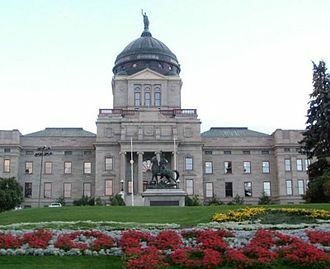 This is a broad outline history of the state of Montana in the United States. Archeological evidence has shown indigenous peoples lived in the area for more than 12,000 years, the oldest dated human burial site in North America was located in 1968 near Wilsall, Montana at what is now known as the Anzick site. The human remains of an infant, found at the Anzick site along with Clovis culture artifacts. Most indigenous people of the region were nomadic, following the herds and other game. Several major tribal groups made their home in and around the land became Montana. 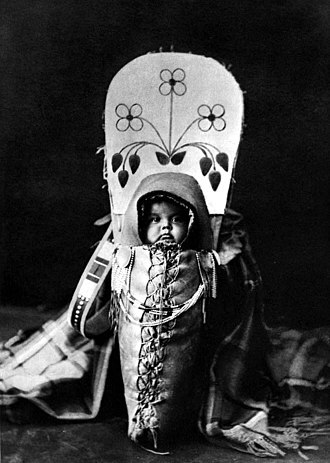 The Crow, a Siouan-language people, known as the Apsáalooke, were the first of the native nations currently living in Montana to arrive in the region, around 1700 AD they moved from Alberta to south-central Montana and northern Wyoming. The Cheyenne have a reservation in the portion of the state, east. The Cheyenne language is part of the larger Algonquian language group, the closest linguistic relatives of the Cheyenne language are Arapaho and Ojibwa. Little is known about the Cheyenne people before the 16th century, the Blackfeet reservation today is located in northern Montana adjacent to Glacier National Park. Their nation consisted of three branches, the Piegan, the Blood, and the Siksika. In the summer, they lived a nomadic, hunting lifestyle, and in the winter and they did not move camp in winter unless food for the people and horses or firewood became depleted. The Assiniboine known by the Ojibwe exonym Asiniibwaan, today live on the Fort Peck Indian Reservation in Northeastern Montana shared with a branch of the Sioux nation, intermarriage has led to some of the people now identifying as Assiniboine Sioux. 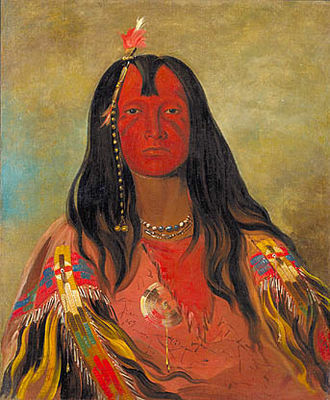 They were well known throughout much of the late 18th and early 19th centuries, images of Assiniboine people were painted by such 19th-century artists as Karl Bodmer and George Catlin. 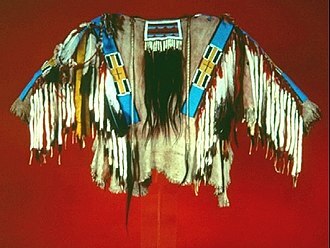 The Assiniboine have many similarities to the Lakota Sioux in lifestyle and they are considered a band of the Nakoda, or middle division of the Sioux nation. The Endicott Fruit Tree is a pear tree that was planted in the 1630s. It is the oldest living cultivated fruit tree in North America. Local law stipulates that it must remain undisturbed and is the town's prized possession, appearing on its seal. The Endicott family was a very prominent one that played a role in dispersing cider and perry apples right through the nineteenth century. The USDA has taken cuttings to examine it for its longevity and possibly plant its clones so the DNA may live on after the tree dies; the cultivar itself is quite rare. Eagle Vineyard, Baronet Apple Wine. Label from California Historical Society. Swedish gold panners in 1860s Montana. 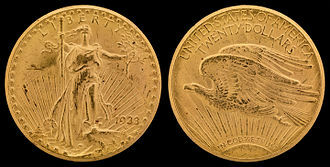 The Montana gold rush began in 1862.